Clarksville, TN – Fans of Beachaven Winery’s Jazz on the Lawn series were a bit disappointed this weekend as Saturday’s show featuring the Consouselors had to be altered at the last minute for safety concerns. 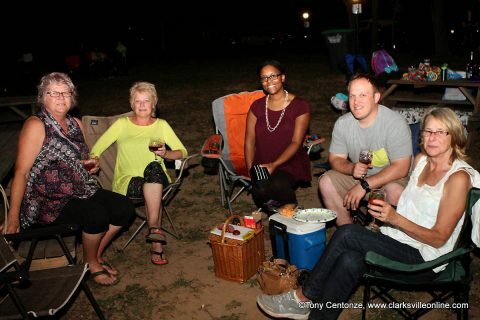 After a beautiful week of weather leading up to Saturday’s event, remnants of Hurricane Nate moved through the area over the weekend and organizers were forced to cancel the band, and not set up the outside wine sales area. A threat of severe weather caused a cancellation of the band for Saturday’s Jazz on the Lawn, but many stayed around for a DJ. Jazz on the Lawn bands usually play from 6:30pm–9:30pm, but concerns for their safety, as well as that of Beachaven’s valued customers and employees, prompted organizers to make a decision based on the threatening forecast. Some guests were not deterred by the wind and dark clouds, sticking around to listen to music provided by a DJ until 8:00pm. A couple of hundred guests stayed for the music, some of whom had driven from as far away as Indianapolis for Saturday’s show. Jazz on the Lawn’s final installment of 2017 will be held Saturday, October 21st, 2017 at Beachaven Vineyards & Winery, 1100 Dunlop Lane. This is always one of Beachaven fans’ favorite events of the year. Joel Brown and his band will be performing, and everyone is invited to come wearing their best Halloween costume for a chance to win prizes in one of the city’s biggest and best Halloween costume contests.